The Remains of a Day, c. 1300 A.D.
Large archaeological sites like Moundville are end results of thousands and thousands of individual human actions: earthen mounds pile up basketload by basketload; pots shatter and are swept into trash heaps; towns sprawl wall-trench and posthole at a time. In the course of archaeological fieldwork, we are often confronted these “moments in time.” Sometimes we can reconstruct plausible short-term chains of actions by studying layered deposits. The recent findings of the MPP provide a nice example of this. Team 3 has been excavating in a 1-x-4 meter trench for about two weeks. In the last post (“Posts, Pits, and Ancient Houses”), you can see photo of the trench as it appeared Friday before last. We’ve made a lot of progress since then and we know much more about what caused the magnetic anomaly at this location as a result. The trench now crosscuts a 2-meter section of what appears to be a large trash pit containing animal bone, stone tools and debitage, ash, and broken utilitarian pottery. These remains and the ways in which they are distributed throughout the pit suggest that at least the lower portions of the deposit are the result of a feasting event. Ceramics suggest a date for the pit of sometime during the latter half of the 13th century, or just after the construction of Moundville’s mound-and-plaza complex. A 10 centimeter thick cut across the top of the pit exposed easily distinguishable lobes of midden (trash remains) and fill. The outer edge of the pit (a) consists of a rich layer of deer bones interspersed with stone tools. 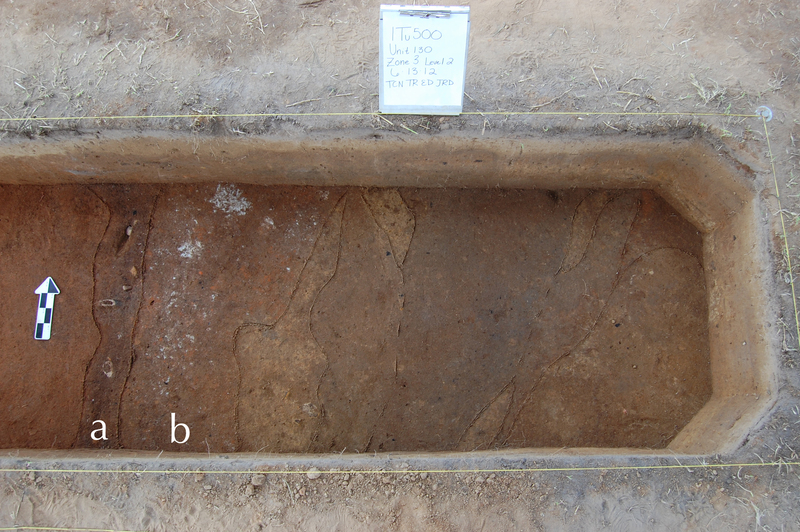 A dense ashy blanket (b) directly overlying this artifact-rich layer may represent the cleaning out of nearby cooking pits. The various zones of the pit are delineated in this photo in preparation for mapping. The photo above shows a horizontal cross-section of the trash pit. The unit crosscuts the layers such that we can discern the order in which they were created. We know for sure that the ash layer was deposited after the layer of deer bone, for instance. If we zoom in closer and note the associations between artifacts in the “deer bone layer,” we can say a bit more. The distal end of a deer humerus (where the upper part of the front leg connects to the elbow) and a deer mandible with molars mostly intact. The bone is quite fragile. First, we have uncovered about 10 individual bones so far, representing the remains of at least 2 deer. All are front shoulder and jaw parts. 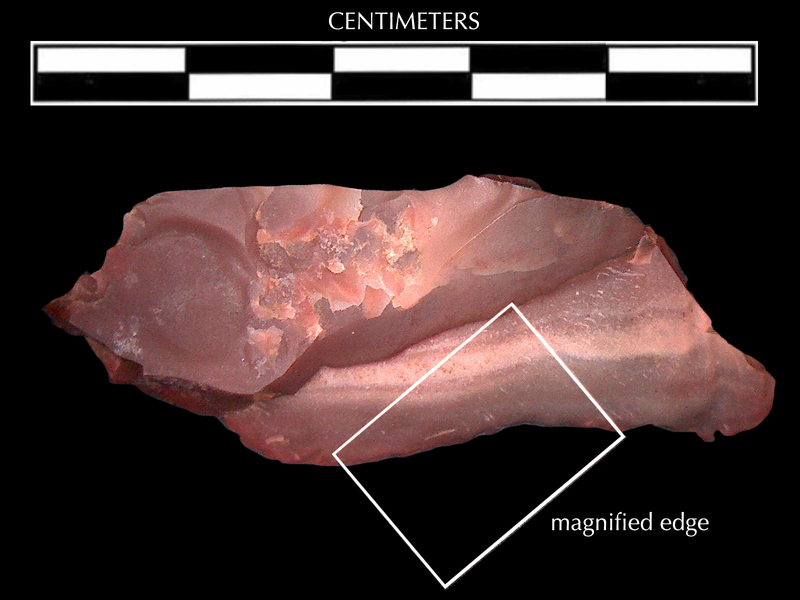 These parts of the deer are overrepresented in Moundville trash heaps in comparison to other parts of the deer, suggesting that the ancient people considered these choice cuts of meat: shoulder and tongue, to be precise. Small stone tools provide additional clues. We discovered two projectile points amidst the bones, perhaps the arrows that felled the deer. A razor-sharp stone flake dulled from use on one edge was found just beneath one of the shoulder blades. 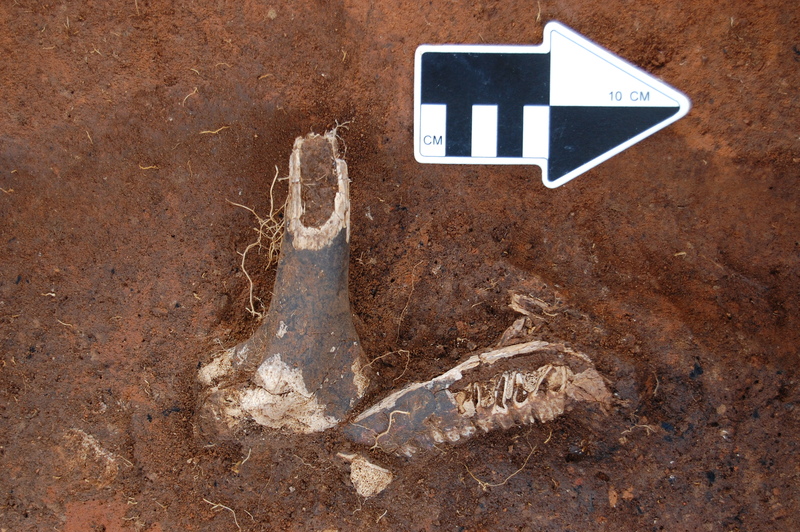 The people of Moundville did not use formal stone knives to process their meat, instead favoring one-time-use flakes struck from flint cobbles. This “expedient tool technology” is typical of Mississippian groups. More deer bone: a second humerus and a scapula (shoulder blade). 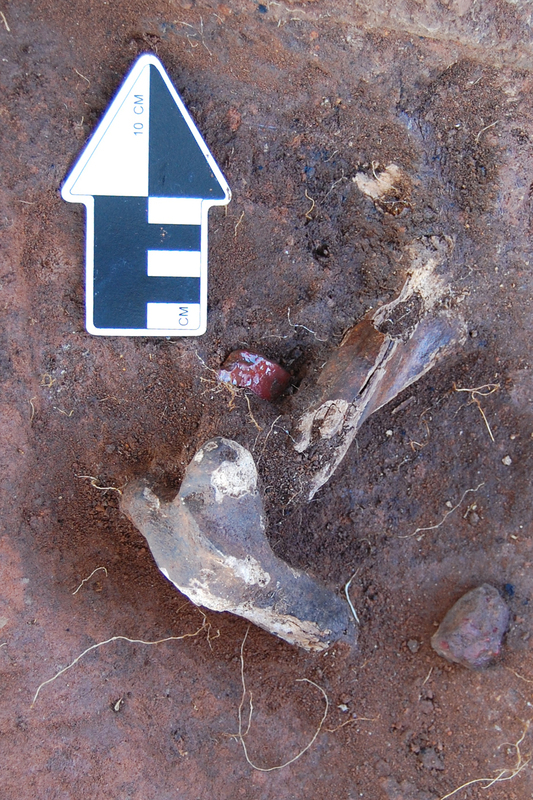 The shiny red object is a worn stone blade that directly underlies the shoulder blade, probably the same used to slice the meat from the bone. The used blade, an “expedient tool,” found alongside deer remains. 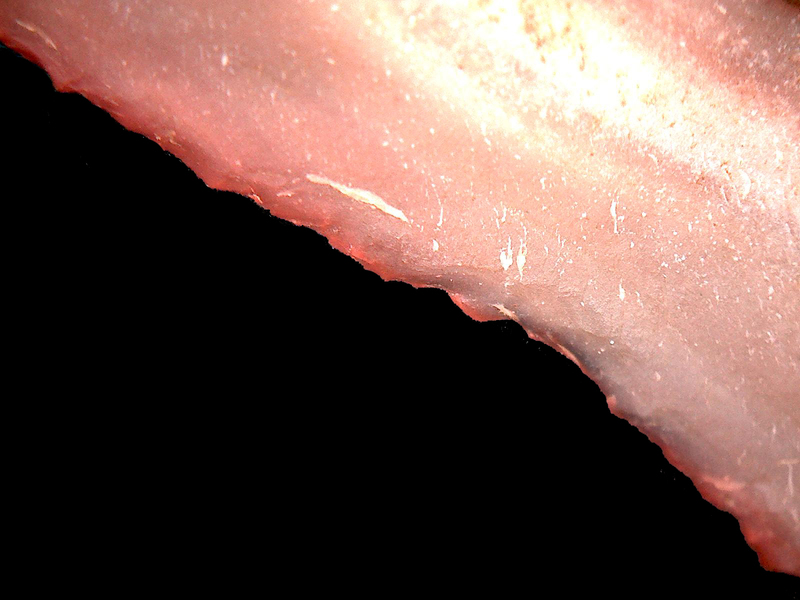 A magnified section of the used edge of the blade. The nicked and jagged edge of this stone tool indicates that it was used for some purpose – butchering a deer, most likely – before being discarded. A layer of clay and dense ash concentrations overlies the bones and artifacts. It’s not stretching the imagination too far to suggest that at least some this ash represents the cleaning out of nearby cooking pits. All in all, these two pit layers and the objects they contain reveal a possible short-term sequence of actions/events: a hunt, processing of the game with an expedient tool, and cooking the meat. These aren’t revelations of the sort that will surprise any Southeastern archaeologist, but it’s fun to imagine the connections of these mundane objects to real human lives. They have an ageless quality, as if they were discarded only recently, rather than in the early days of Moundville over seven centuries ago. All I can say is WOW! Learning so much. Maybe I can teach the Native American Georgians a little better this FALL! That’s an interesting archaeological post. I am always happy to read about what’s going on in the archaeological site. Until today I hadn’t heard about Moundville.